Handmade 100% Natural Herbal Soap. 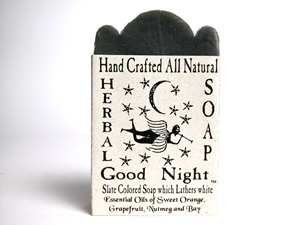 Good Night is a slate colored soap which lathers white. Contains the essential oils of Sweet Orange, Grapefruit, Nutmeg, and Bay. Only the purest aromatherapy essential oils of flowers and herbs are used. The soaps are unsurpassed in their mildness and quality. Necessary ingredients include coconut oil for a rich creamy lather, olive oil as a moisturizer,and palm oil to insure a long lasting bar of soap. 100 percent biodegradable and cruelty-free. Handmade 100% Natural Herbal Soap. Nipt in The Bud is a Rose blend. It contains the essential oils of Rosewood, Palma, Rosa, & Bergamot. Handmade 100% Natural Herbal Soap. Roots to Fruitcontains the essential oils of Ginger, Lime, Clove, and Patchouli with a touch of Ginger root. Handmade 100% Natural Herbal Soap Spice of Life has aloe vera added and marbled with cinnamon powder. Contains the essential oils of Cinnamon and Patchouli.